Some people insist on describing the autistic spectrum as ranging from the non-speaking and very profoundly disabled, to the “just quirky.” Or, during discussions about the need for acceptance and accommodation, the same people might tell autistic self-advocates, “That may be fine for autistic people like you who are just quirky, but you're not like my child.” Some of those same people even insist that autistic people who are “just quirky” should probably have a different label than 'autism' altogether. 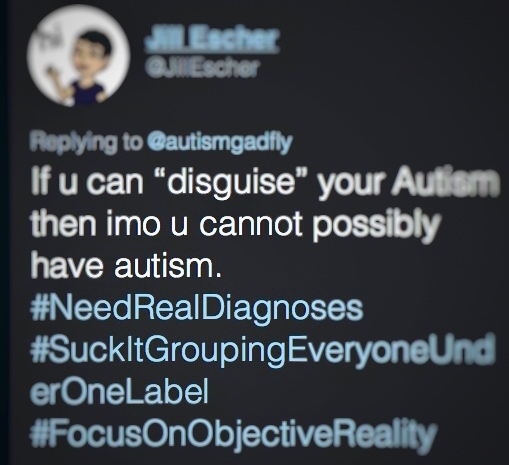 reads, "If u can"disguise" your autism then imo u cannot possibly have autism. But I actually wouldn’t mind if the word “quirky” were to disappear entirely from autism discussions, and take with it the dismissive and simplistic idea that autism is a condition with only two manifestations—the genuinely disabled, and the "just quirky." Autism has specific diagnostic criteria. Though these criteria have changed and broadened since autism first appeared in the DSM in 1980, the more important changes leading to autism's diagnostic explosion hinge on discrediting outdated and invented prejudices about who can and can’t be autistic. At various times, it has been believed—implicitly or explicitly—that people who could not be autistic included adults, women and girls, people with intellectual disabilities, people without intellectual disabilities, people of color, children who ever spoke, children who toe-walked, people with ADHD, and people with virtually any other identifiable anomaly of brain physiology. That is a lot of autistic people who were simply excluded from diagnosis by completely arbitrary factors having little to do with the nature of autism itself. And while it is reasonable for people to debate about exactly what form autism diagnostic criteria should take, “quirky” has simply never been among those criteria. No one is diagnosed with autism on the basis of being “just quirky.” That’s a characterization far more likely to be used to deny a diagnosis to women, girls, female-presenting and gender non-conforming people, as well as those who don’t fit other common stereotypes or more conventionally accepted presentations of autism. When I’m talking about our need for acceptance and respect as autistic people, I am not talking about being quirky. While I do have traits that I suppose could fairly be considered “quirky,” like an affection for knee socks and collage art and eating breakfast food for dinner, those are not what I’m talking about when I’m talking about being autistic. When I’m talking about the challenges posed to me by inertia and task-switching and significant motor planning issues, I’m not talking about being quirky. When I’m talking about whole-body nervous system pain from sensory overload, I am not talking about being quirky. When I’m talking about language processing differences that can leave me feeling like I’m speaking English as a second language compared with NT peers, and that I can command the physical and mental effort required for speech for a cumulative maximum of two hours per day under most circumstances without becoming physically ill, I am not talking about being quirky. When people use “the voice” on me, treat me like I’m invisible, or grab things out of my hands at work, that doesn’t happen because I’m quirky. And I’m sure not talking about being quirky when I describe being pushed into meltdowns by disruptions to my routines or expectations, or that I grew up to feel not even human or maybe not even real, because I had no other explanation for why I wasn’t like everyone else and everything was so hard. When people don’t believe me when I say I can’t do something they think should be easy, I don’t think that’s because I’m quirky. No, it’s because I’m autistic. This doesn’t mean that I’m exactly like every other autistic person, but no person is exactly like every other person in a designated group, autistic or not. All humans, and all humans of various identity groups, have important commonalities as well as whole constellations of different abilities and challenges of varying intensity. The DSM defines autistic people as having commonalities in social communication issues, restricted interests, repetitive behaviors, and impairments in adaptive living skills. Autistic people, and some of the better autism research starting to emerge, are like to consider those issues as resulting from core processing differences in how the brain governs factors like movement, sensory feedback, executive functioning, and atypical experiences of language. What autistic people tend to share are those autistic commonalities. What is decidedly not the case is that autistic people with very profound support needs in every aspect of daily life have somehow been arbitrarily assigned to the same diagnostic label as people who are "only" socially awkward. Autistic people are autistic because we display a common, distinctive pattern of observed challenges across a range of domains. While I think the DSM-5 currently does a poor job of conceptualizing the core features of autism coherently (and that probably contributes to much of this present confusion), many autistic people experience, and conceive of, those observed features as resulting from a deeper stratus of physical and cognitive experiences of the world. And many of those perceptual experiences are described remarkably similarly by people all across the spectrum. This means that while the expression or “severity” of our challenges as autistic people may vary widely, but the underlying reasons for those challenges often prove similar. That is why a person who lives with minimal support needs, holds down a job, and sounds “articulate” to your ears, may in fact have the very same disability as someone who needs a high degree of support, cannot speak, or whose movement differences are very apparent. So, although, for instance, while Leo and I are very different in some important ways, the way his mom describes his physical intelligence and tactile engagement with the world is very familiar to me. Mel and I are different in important ways, but when sie describes autism in terms of the ecologies of cliffs and valleys, that is very familiar to the way in which I actually experience it. Julia and I are different in important ways, but when she describes what it’s like to see “someone who moves like you,” that is a feeling with which I am intimately acquainted. I will never forget when, shortly after I’d been diagnosed and started connecting for the first time with both autistic and parent blogging communities online, the mother of a young man with very extensive verbal communication difficulties described instances when he would suddenly seem sad or even start crying, seemingly for no reason in his present circumstances she could discern or that he could describe. She was wondering whether it could be that he was simply in the grip of a memory so powerful that its emotional intensity was completely overwhelming. And a whole chorus of about half a dozen autistic adult women—all of us able to communicate in writing, some of us with things like jobs and marriages—replied that yes, that’s something most of us had actually experienced. An autistic person who has an autism diagnosis had a professional believe they should have that diagnosis for good reason. It’s not that misdiagnoses never happen, but—particularly for those who aren’t white and male or don’t conform to other stereotypes—it is not a particularly easy thing to convince a professional that one is autistic, without substantial proof. Autistic people are, troublingly, more likely to have professionals tell us they “don’t see it” if we’re into English literature or art instead of math or computer programming, or if we display emotion or empathy. It’s okay to look at one autistic person and not necessarily understand how their experiences compare to those of another autistic person you know. It’s not okay to dismiss that first person's lived experience as having nothing to do with “real” autism simply because you don’t understand what autism is like for them. In fact, listening to autistic people who have different experiences from the autistic people in your life might present a great opportunity to become more familiar with a wider variety of autistic experiences. But please know: when I am talking about being autistic, I am not talking about being quirky. If you are, then we are not talking about the same thing.